A couple months with the new Synology DiskStation DS1618+ has demonstrated one thing above all: I should have bought a Synology NAS years ago. As a tech-savvy guy who’s married to a photographer, and has been in a decision-making role of a few small tech businesses, I’ve had more than my share of experience with mass file storage and NAS devices. Once configured, I’ve never owned one that I couldn’t get along with. That said, setting NAS equipment up often drove me to fits of rage-cussing and the temptation to stomp on whatever technology was nearest me at any given moment during the process. I’ve personally experienced countless issues. If it wasn’t difficulties with user configs, security, and RAID levels, it was networking or getting backups properly synced. The DS1618+ is the first NAS setup I’ve done that was truly hassle-free. From installing drives without tools to accessing the DiskStation’s filesystem remotely from my phone or another PC, Synology’s ecosystem seems to have the answers before I ask the questions. 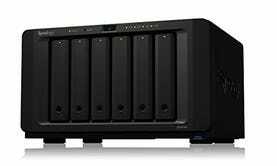 Competitively priced at $800, Synology didn’t skimp on hardware. The DS1618+ is driven by a C3-Series Intel Atom Quad core 2.1 GHz processor, and 4GB of RAM (expandable to 32GB). It’s compact- okay, as compact as anything with six lockable hot-swap hard drive bays and a PCI-e slot can be. There are three USB Ports (one on the front) for external storage, a couple of eSATA ports, and four LAN ports for failover or link aggregation. This DiskStation is not lacking on options or upgradability. This six-bay beast is currently overkill for my home, so I opted to use just two of the bays. 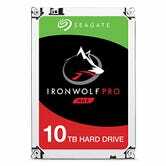 I installed (literally just clipped them in) a pair of spectacular Seagate IronWolf Pro 10TB 7200RPM hard drives and booted it up. After a short startup sequence, lights glowed steady and it was ready for further instructions. I connected a Cat6 cable to one of the four (I know, four!) LAN ports on the back, then downloaded and ran the 9MB Synology Assistant application. It took just a few seconds to scan my network and find the drive. A couple seconds later and I was logged into the DiskStation’s DSM operating system, presenting itself through my web browser as a well-designed and refined icon-based desktop GUI. I can’t say enough how amazing the browser-based DSM software is. It’s what I’ve sorely missed in any competing brand’s NAS offering. The OS is naturally intuitive to anyone who’s used Windows or macOS. DSM’s Control Panel grants easy access to an overwhelming number system options, information, and configurations. The QuickConnect wizard is especially nice. With just a few clicks and decisions, DSM will configure your network and set up remote access via your very own synology.me subdomain. The File Station is a file manager akin to Windows Explorer or macOS Finder. What you expect in terms of folder browsing, file information, and the ability to download anything stored on your DiskStation is here. What you might not expect is real-time document collaboration, and execution of file formats like .jpgs and .mp3s without downloading them to your local machine. Finally, DSM’s Package Center is an app store that allows even more versatility and customization to your DiskStation. So how does it function for backups? I wouldn’t be this excited about the DS1618+ if it wasn’t a stellar network attached storage device. 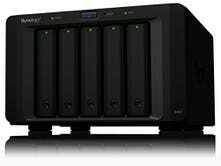 About any RAID configuration you prefer is supported, and Synology’s default Hybrid RAID is an easy, flexible option perfectly suited for most users. As you need to add or replace drives down the road, DSM will automatically assimilate them with only a few clicks effort. The DS1618+ is as fast as most networks will allow, especially with link aggregation over multiple LAN ports. 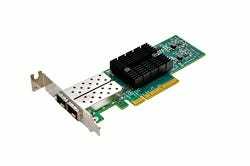 If your network does happen to outclass it, Synology has a 10 GB PCIe network card you can drop in. 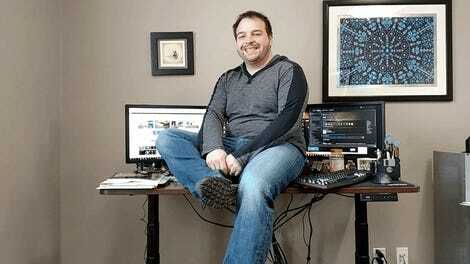 I set up nightly backups for seven devices without regard for scheduling, and the DiskStation didn’t complain once. DSM even makes it easy to backup your backup to an offsite location, or another Synology NAS. The DiskStation DS1618+ was engineered to be more future-proof than anything else comparable on the market. In addition to the aforementioned RAM and PCI-e upgrade options, you can even add up to 10 extra drive bays with a pair of expansion units. With the DS1618+ and its brethren, Synology put performance, data security, and scalability front and center. 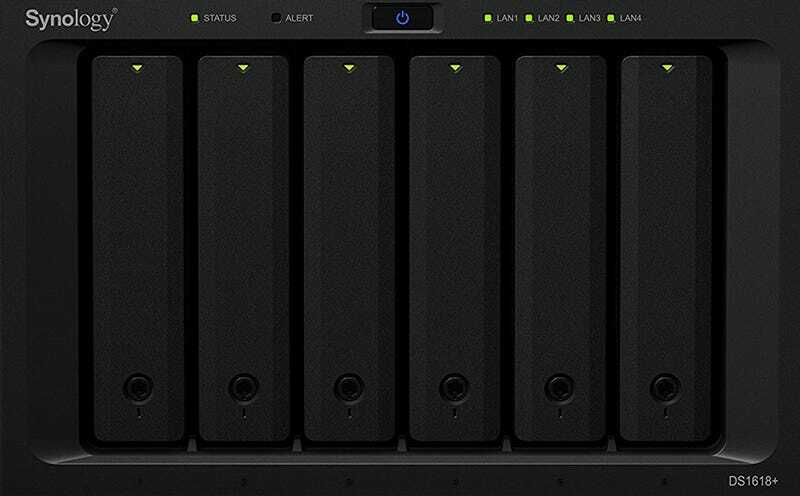 Synology offers seven configurations ranging from 2 to 12 bays, so regardless whether you’re just a media-heavy home user, a business with on-the-fly encryption needs, or anything between, there’s a Diskstation with your name on it.